Originally created for Introduction to Digital Media. Adapted for Media & Cultural Analysis. We will use Tumblr to share news, art, and activism about and involving digital media. Everyone shares the same username and password—this means everyone also takes responsibility for curating the posts and reblogs that appear on our Tumblr account. One of the goals of this class is to interrogate the claim that the user is in charge of the web in our current era of digital media. Over the first weeks of the semester, students read and discussed various layers of digital media that support or disrupt this claim of user sovereignty. In order to deepen students’ understanding of the various layers and infrastructures that make up digital media, this midterm develops a cohesive picture of a student’s location within the micro and macro structures of digital media. Students present their analyses in a creative digital format featuring text, images, and videos. Each week, one or more of you will present an additional film or TV program that corresponds to the topic of the week. In addition to the in-class presentation, you will curate a clip in the style of In Media Res. That is, you select a scene from a film or TV program and analyze it in 450 words. The clip and analysis will become part of our class archive on our NYU Stream channel. The goal of this assignment is the creation of your own transmedia storytelling experience. You can create this experience either for a current or past TV show or for a TV show that you design. This assignment has three stages: a draft, a pitch, and the submission of the final project. The goal of your research project is to carry out an independent research project on global television. In terms of topics, you could work on the international distribution of American TV, on a local case study in a country of your choice, or on the adaptation or broadcasting of international programming in the United States. You can also come up with another topic not covered by these suggestions. Your project can take the form of a traditional essay or a video, photography, remix, website, online exhibit, etc. The goal of this assignment is create a remix out of pre-existing media sources including print, audio and visual materials. Your remix should make an argument about the cultural practice of remixing and the various challenges it faces in terms of legal and corporate restrictions. In short, you will create a remix about remixing. The goal of this assignment is to construct a sequence of ten images as a visual essay that explores a media/technology theme of the student’s choice (for example, old vs. new media; individuality and choice; information overload; storage and access; indexes; materiality; networks). Students explain their essays’ themes and conceptualizations in 1,000-word project statements. For this assignment, students created a collective overview of readings and discussions during the “TV Studies Bootcamp” weeks of my Transmedia TV course. Students worked in groups to review key ideas and terms in television studies and present them in the form of a Prezi to the class. I frequently assign critical reading responses in the form of writing journals and blog posts. 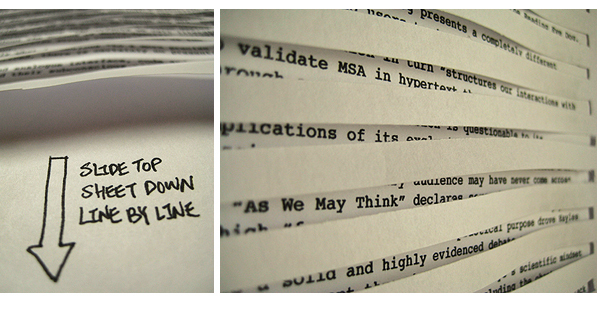 For my course Media/Technology/Everyday Life, I reinvisioned the traditional reading response as a “Crazy” Paper. The crazy paper has the following parameters: the response cannot be longer than one page; there are no restrictions in terms of font, line spacing, or margins, etc., but the paper must be legible; the response must make a connection between form and content: students use typography to draw attention to the materiality of their writing. Jerome’s design concept: In designing this essay, I focused primarily on the emphasis [N. Katherine] Hayles’ placed on material metaphors and media-specific analysis in hypertext [in her book Writing Machines].The conventional method of reading an essay is to read it from top to bottom, where the bottom represents the end of the essay. This layout requires the reader to shift the middle sheet down slightly to accommodate a new line of text, thereby reintroducing a hidden section of the essay. Essentially I call this method of distributing my essay mechanical hypertext because a movement of the sheet immediately brings forth new content. As Hayles argues herself, hypertext should not be strictly limited to the digital and the material metaphor of a piece of content will determine and alter your interactions with it.